Patrick Deneen writes a blog called, "What I Saw in America". In it, he is constantly spanking our culture for having its morals out of whack, and constantly demanding its own way through perceived "rights". Deneen just finished posting an article on the poor man, trampled to death, during the opening seconds of a Wal-Mart store's Black Friday sale. "Yet, in both instances, the root cause of each challenge, and our flailing and feeble reaction, are the same. Both have been caused by the refusal to live within our means, to borrow against the future in the name of present satisfaction. Both are born of a misguided and unearned belief in entitlement. Both are sustained by a profound self-induced blindness to costs and consequences. Both are rooted in our learned ability to divorce ourselves from past and future alike, to disconnect ourselves from an understanding of our place in generations, the obligations we bear from the past and the duties we owe to the future. Both crises were fomented by the destruction of cultures - undermined by their replacement by instant gratification and the profligate employment of energy utilized to decouple our lived lives from everything necessary for the sustenance of life and the maintenance of culture, above all by disconnecting folkways of human life to particular places and particular people." Hop over and give Patrick's blog a read. I think you will find a voice crying for sanity, reason, and a return to those things that truly promote a great culture. I was reading George M. Marsden's, "Jonathan Edwards - A Life", this evening, and I came across some prose that young Jonathan wrote to his future wife. Tradition has it that it was written in 1723. This would have put Sarah Pierpont at age 13, and Jonathan Edwards, at 20 years of age. Although they were not married until 1727, Jonathan was clearly smitten by young Sarah. "They say there is a young lady in [New Haven] who is beloved of that almighty Being, who made and rules the world, and that there are certain seasons in which this great Being, in some way or other invisible, comes to her and fills her mind with exceeding sweet delight, and that she hardly cares for anything, except to meditate on him--that she expects after a while to be received up where he is, to be raised out of the world and caught up into heaven; being assured that he loves her too well to let her remain at a distance from him always. There she is to dwell with him, and to be ravished with his love, favor and delight, forever. Therefore, if you present all the world before her, with the richest of its treasures, she disregards it and cares not for it, and is unmindful of any pain or affliction. She has a strange sweetness in her mind, and sweetness of temper, uncommon purity in her affections; is most just and praiseworthy in all her actions; and you could not persuade her to do anything thought wrong or sinful, if you would give her all the world, lest she should offend this great Being. She is of a wonderful sweetness, calmness and universal benevolence of mind; especially after those times in which this great God has manifested himself to her mind. She will sometimes go about, singing sweetly, from place to [place]; and seems to be always full of joy and pleasure, and no one knows for what. She loves to be alone, and to wander in the fields and on the mountains, and seems to have someone invisible always conversing with her." I don't know, but I suspect he had her heart after this praise-filled letter. National Gallery of Art - Videos & Podcasts - I went to a Christian Liberal Arts College to obtain my B.A. During my time at John Wesley College, Dr. John Bowman, my vocal performance professor, instilled in me a love for the arts. The National Gallery of Art, in Washington, D.C., is a favorite spot of mine. The above link has many wonderful explorations into man's expression. 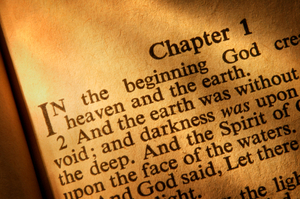 Reading Christian Classics Together On-line - Tim Challies is a Christian blogger near Toronto. He is an author, writes a successful blog, as well a web designer. Tim has just launched his fifth round of "Reading Christian Classics Together", where this time around we will be reading C.S. Lewis', "Mere Christianity". This will be my third reading, with hundreds of Christians, from all over the world. I highly recommend it. John MacArthur opens his vault - I find Dr. John MacArthur to be a great resource in my Christian walk. He is highly skilled in the Bible's teachings, and is completely unashamed to speak it's saving grace to the world. Until recently, much of his material was only available for purchase. 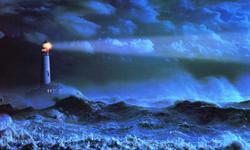 Recently, however, he has opened up his vast library, free, to the on-line community. Through the wonder of the Internet, this boomer is sitting in his pews, each and every Sunday. Mortgage Broker Coaching, LLC. 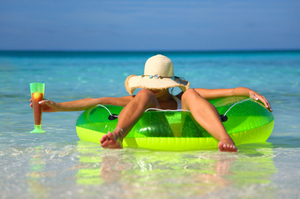 - If you follow this blog at all, you will perhaps remember that my whole worldview, regarding retirement, has changed. We are now a month into our new consulting company, and enjoying building a new enterprise. The mortgage industry is very challenging right now. My hope is that I can share my experience, with younger owners, and help them dodge a few potholes. With this website, I will be offering video and audio podcasts. I just put up my first series of seven videos. Stop by and share your thoughts and comments. Twitter - I have been experimenting with Twitter. 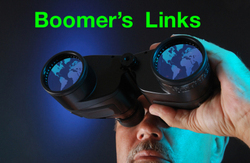 If you care to tweet with the Boomer, you can do it at @boomerinthepew, or @mtgbrokercoach. This is the 19th, and final post in my study of Jonathan Edwards famous text, Religious Affections . I have also created a landing page to hold all of the posts in this study for you here. "Gracious and holy affections have their exercise and fruit in Christian practice. I mean, they have that influence and power upon him who is the subject of 'em, that they cause that a practice, which is universally conformed to, and directed by Christian rules, should be the practice and business of his life." This can get a little dicey if you aren't careful, because, as Edwards points out, works are not requisite to obtain saving faith, but are clearly an evidential, and essential sign of true faith. Matthew 5:16 - "...let your light shine before others, so that they may see your good works and give glory to you Father who is in heaven." Earlier, in his treatise, Edwards talked about how we are now the lanterns, that were found in the holy of holies of old. When the Holy Spirit is present, then there is present a "glow" that is not found in the natural man. This glow, if genuine, does not bring attention to the bearer of the glow, but glows in such a way that God is glorified. That is an amazingly challenging proposition. I am to live my life, in such a way, that men see my practices, and seeing my practices, give glory to God. This has nothing to do with my ego. Through my sanctification journey, I am to glow more, and more, thereby drawing attention to the light, and not the lantern. If you deeply meditate on that verse, and continually seek to implement that light, your life can, and will change. For the true Christian, you will find depths and understandings, from this brilliant man, that were likely not evident to you before. In spite of his brilliance, not once did I see any ego from Edwards. His constant attention was pointing towards Christ, always guided by a healthy dose of Scripture. For those who do not possess a true faith, yet claim to have a true faith, Edwards will be continually knocking you aside the head with the Holy Spirit's 2X4. Before I started reading this book, I heard of a few who made claim to knowing people who lost their faith reading this text. Having read this text, I now find that claim preposterous. This text will either greatly deepen your faith, or point out to you, that you, in fact, have no saving faith. This was a profoundly moving, and life changing read. I will be back, and furthermore, look forward to becoming great friends with Edwards, by reading significantly more of his works in the future. How can we know that the Bible is God's Word? Yesterday I was having a very interesting conversation with a loved one, who, at the end of the day, wonders how anyone can believe that the Bible is the actual, inerrant word of God. This is a very important question for the Christian faith. If we can not rely on this book to contain God's absolute, authoritative, inerrant word, then the whole of Christianity is suspect. So...can a reasonable, thinking person have that belief? Is the Bible truly God's holy word? Frankly, I am not an authority on such an important question. Therefore, I am going to hand the question off to someone who is an authority, Dr. Wayne Grudem. Dr. Grudem is one of the world's most respected theologians, and has written extensively on this very subject. How is it possible that the book of Genesis, supposedly written by Moses, exists today with no changes in his original text? How do we know that the books contained in our New Testament are the only books that God would have us read. What about the Gnostic Gospels? Did the Catholic church really suppress God's real information, as purported in Dan Brown's "DaVinci Code"? How is it possible, for a rational person, to believe that these words are the actual, inerrant words of God? There are other faiths, the Mormons for example, who make the claim that God has a third book, the Book of Mormon. What about the Muslim Qur'an? As you can see, there are many voices regarding God's word to us. How are we to know? If you are uncertain of this question, or furthermore, are uncertain how to answer this question, spend some time with Dr. Grudem. He is easy to listen to, and brings tremendous perspective on this very important issue. This morning I was doing a little catch up reading in my Google Reader. 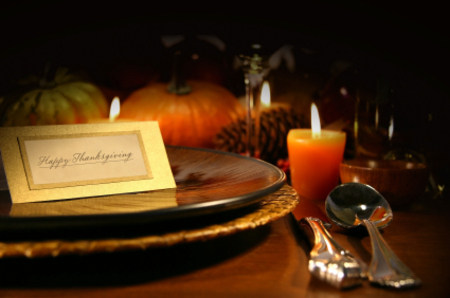 My blogging friend, Barry Wallace, has written an interesting story on Thanksgiving, looking through the eyes of our nation's historical documents. "That at one Time and with one Voice, the good People may express the grateful Feelings of their Hearts, and consecrate themselves to the Service of their Divine Benefactor; and that, together with their sincere Acknowledgments and Offerings, they may join the penitent Confession of their manifold Sins, whereby they had forfeited every Favor; and their humble and earnest Supplication that it may please GOD through the Merits of JESUS CHRIST, mercifully to forgive and blot them out of Remembrance..."
In reading these heartfelt calls to prayer and thanksgiving, I decided to hop over to the White House's website, to see what they were putting forth for Thanksgiving Day. As you can see from this photograph, and also featured front and center on the White House website, it is the pardoning of a turkey from certain death. These pardoned turkey's then went on to Disneyland to take part in a parade. Now, don't get me wrong. I find nothing wrong with a little fun and frivolity. I enjoy many of our Thanksgiving traditions, just like millions all over this nation. And to be fair, there was a Thanksgiving Proclamation, and the President's radio address, gave a veiled reference to God. But, clearly our country doesn't enjoy the same relationship it once had with God Almighty. My heart this morning, to my sons and family, is to call upon you to take some time to reflect back on our nation, and our lives, and to recognize, in spite of this horrendous economy, the incredible blessings we have all received from God. Furthermore, upon that recognition, to take time to thank God for his blessings, and ask Him to be more present in our lives, and country. As I have recently so well learned, it is very difficult to truly be thankful, when you are swimming in wealth, as we are in this country. Force yourself to take some time to meditate back to those who gave so much, force yourself to understand the source of their strength and character, and force yourself, with bent knee, to proclaim your deep gratitude to God for His blessings to you, and our nation. 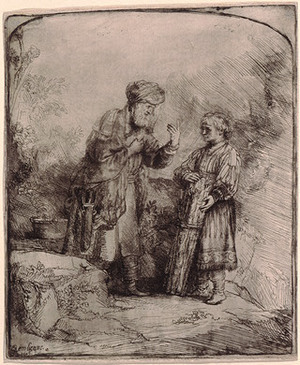 "Abraham and Issac", 1645, by Rembrandt van Rijn @ The National Gallary of Art in Washington, DC. This is the 18th post in my study of Jonathan Edwards famous text, Religious Affections . I have also created a landing page to hold all of the posts in this study for you here. We now come to Jonathan Edwards last evidence of the true Christian. The previous eleven such evidences, dealt primarily with an inner view of the true Christian. Here, we come to an outer view. Here we see how the true Christian will behave. It is quite evident that this particular "gracious affection" was important to Edwards, as he devotes eighty pages to this topic. "Gracious and holy affections have their exercise and fruit in Christian practice. I mean, they have that influence and power upon him who is the subject of 'em, that they cause that a practice, which is universally conformed to, and directed by Christian rules, should be the practice and business of his life. This implies three things; (1) That his behavior or practice in the world, be universally conformed to, and directed by Christian rules. (2) That he makes a business of such a holy practice above all things; that it be a business which he is chiefly engaged in, and devoted to, and pursues with highest earnestness and diligence: so that he may be said to make this practice of religion eminently his work and business. And (3) That he persists in it to the end of life: so that it may be said, not only to be his business at certain seasons, the business of Sabbath days, or certain extraordinary times, or the business of a month, or a year, or of seven years, or his business under certain circumstances; but the business of his life; it being that business which he perseveres in through all changes, and under all trials, as long as he lives." 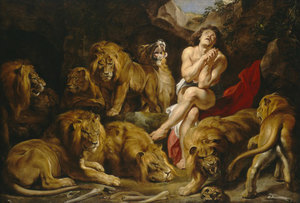 "Daniel in the Lions' Den", c. 1614/1616, by Sir Peter Paul Rubens. I have 6 different podcasts that I rotate through during the week, while I workout. The authors include Mark Devers, John Piper, John MacArthur, Steve Lawson, Albert Mohler, and Chuck Swindoll. Chuck Swindoll is a recent addition to my podcast subscriptions, and I caught him midstream in a series on the life of Daniel. Last week, my wife and I drove to Las Vegas for a conference, and had 10 hours to spend in our vehicle. I decided to use this opportunity to catch up on Dr. Charles Swindoll's podcast on the book of Daniel. I was somewhat familiar with Daniel's interpretation of King Nebuchadnezzar's dreams, and of his spending a night in the lions' den. What I wasn't all that familiar with was the prophecy contained in the last five chapters of the Book of Daniel. Wow! This is mind bending stuff. The Book of Daniel was written in the sixth century, B.C., yet he gives a great deal of already fulfilled prophecy, nails the date of Christ's return to the very hour, and describes in detail what the end days will look like. To make this all even more facinating, these visions of Daniel, are interpreted several times by the angel Gabriel. It is impossible to read this book, and not have it challenge your faith. These words of Daniel are incredible to read. You will simply discount them as fable, discard them as ludicris, or stand in amazement at this section of God's holy word. I choose to stand in the latter camp! Dr. Swindoll is a masterful teacher, and hold you in rapt attention with his incredible storytelling style. Here is the link to this series on the Book of Daniel. 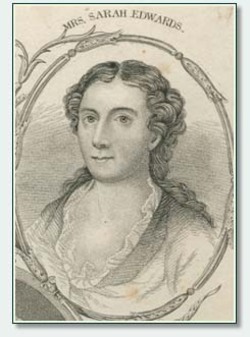 To Jonathan Edwards, a hypocrite, upon his salvation, will resemble the lady in this photograph, in their Christian walk. Perhaps, in becoming a Christian, there was a great deal of labor, a great turning from sin, or even a wondrous conversion experience. But, as Jonathan Edwards explains, in his 11th gracious affection, the journey for the sojourning saint is just beginning, and not a time for relaxation in the laurels of an experience. This is the 17th post in my study of Jonathan Edwards famous text, Religious Affections . I have also created a landing page to hold all of the posts in this study for you here. "Another great and very distinguishing difference between gracious affections and others is, that gracious affections, the higher they are raised, the more is a spiritual appetite and longing of soul after spiritual attainments, increased. On the contrary, false affections rest satisfied in themselves." Remember, Jonathan Edwards wrote this text so that we might be able to distinguish the marks of the true Christian. Here Jonathan shares that the true Christian, upon his/her conversion, doesn't sit back and relax in the comfort of an experience. The true Christian, desperately seeks more, and more of God. Furthermore, the more this thirst is seemingly quenched, the more the thirst's desire becomes.